"Come," cried one of the foresters to the tired messenger, "come join us for this shot. Ho, landlord! Bring a fresh pot of ale for each man." The messenger was a chatty soul and loved a bit of gossip dearly; besides, the pot of ale warmed his heart; so that, settling himself in an easy corner of the inn bench, while the host leaned upon the doorway and the hostess stood with her hands beneath her apron, he unfolded his budget of news with great comfort. He told all from the very first: how Robin Hood had slain the forester, and how he had hidden in the greenwood to escape the law; how that he lived therein, all against the law, God wot, slaying His Majesty's deer and levying toll on fat abbot, knight, and esquire, so that none dare travel even on broad Watling Street or the Fosse Way for fear of him; how that the Sheriff had a mind to serve the King's warrant upon this same rogue, though little would he mind warrant of either king or sheriff, for he was far from being a law-abiding man. Then he told how none could be found in all Nottingham Town to serve this warrant, for fear of cracked pates and broken bones, and how that he, the messenger, was now upon his way to Lincoln Town to find of what mettle the Lincoln men might be. "Now come I, forsooth, from good Banbury Town," said the jolly Tinker, "and no one nigh Nottingham—nor Sherwood either, an that be the mark—can hold cudgel with my grip. Why, lads, did I not meet that mad wag Simon of Ely, even at the famous fair at Hertford Town, and beat him in the ring at that place before Sir Robert of Leslie and his lady? This same Robin Hood, of whom, I wot, I never heard before, is a right merry blade, but gin he be strong, am not I stronger? And gin he be sly, am not I slyer? Now by the bright eyes of Nan o' the Mill, and by mine own name and that's Wat o' the Crabstaff, and by mine own mother's son, and that's myself, will I, even I, Wat o' the Crabstaff, meet this same sturdy rogue, and gin he mind not the seal of our glorious sovereign King Harry, and the warrant of the good Sheriff of Nottinghamshire, I will so bruise, beat, and bemaul his pate that he shall never move finger or toe again! Hear ye that, bully boys?" "I WENT TO GATHER STRAWBERRIES—"
"BY WOODS AND GROVES FULL FAIR—"
Loud laughed Robin and cried, "Now well taken, Tinker, well taken! Why, thy wits are like beer, and do froth up most when they grow sour! But right art thou, man, for I love ale and beer right well. Therefore come straightway with me hard by to the Sign of the Blue Boar, and if thou drinkest as thou appearest—and I wot thou wilt not belie thy looks—I will drench thy throat with as good homebrewed as ever was tapped in all broad Nottinghamshire." No sweeter inn could be found in all Nottinghamshire than that of the Blue Boar. None had such lovely trees standing around, or was so covered with trailing clematis and sweet woodbine; none had such good beer and such humming ale; nor, in wintertime, when the north wind howled and snow drifted around the hedges, was there to be found, elsewhere, such a roaring fire as blazed upon the hearth of the Blue Boar. At such times might be found a goodly company of yeomen or country folk seated around the blazing hearth, bandying merry jests, while roasted crabsbobbed in bowls of ale upon the hearthstone. Well known was the inn to Robin Hood and his band, for there had he and such merry companions as Little John or Will Stutely or young David of Doncaster often gathered when all the forest was filled with snow. As for mine host, he knew how to keep a still tongue in his head, and to swallow his words before they passed his teeth, for he knew very well which side of his bread was spread with butter, for Robin and his band were the best of customers and paid their scores without having them chalked up behind the door. So now, when Robin Hood and the Tinker came thereto and called aloud for two great pots of ale, none would have known from look or speech that the host had ever set eyes upon the outlaw before. 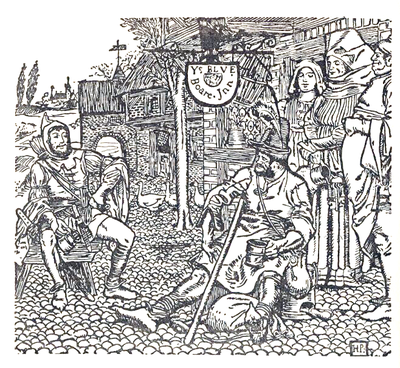 "By Our Lady," said the Tinker, after a long draught of the ale, "yon same Withold of Tamworth—a right good Saxon name, too, I would have thee know—breweth the most humming ale that e'er passed the lips of Wat o' the Crabstaff." The Tinker slept until the afternoon drew to a close and the shadows grew long beside the woodland edge, then he awoke. First he looked up, then he looked down, then he looked east, then he looked west, for he was gathering his wits together, like barley straws blown apart by the wind. First he thought of his merry companion, but he was gone. Then he thought of his stout crabstaff, and that he had within his hand. Then of his warrant, and of the fourscore angels he was to gain for serving it upon Robin Hood. He thrust his hand into his pouch, but not a scrap nor a farthing was there. Then he sprang to his feet in a rage. "Why, yon same is a right stout fellow whom men hereabouts do call Robin Hood, which same—"
"'Good fellow' not me," said the landlord. "Good fellow am I not when it cometh to lose ten shillings! Pay me that thou owest me in broad money, or else leave thy coat and bag and hammer; yet, I wot they are not worth ten shillings, and I shall lose thereby. Nay, an thou stirrest, I have a great dog within and I will loose him upon thee. Maken, open thou the door and let forth Brian if this fellow stirs one step." "Nay," quoth the Tinker—for, by roaming the country, he had learned what dogs were—"take thou what thou wilt have, and let me depart in peace, and may a murrain go with thee. But oh, landlord! An I catch yon scurvy varlet, I swear he shall pay full with usury for that he hath had!"